This has become one of my favorite images. I think it is because I feel drawn into the image. Of course, it could just be that it is the beach in Del Mar. The more I look at it the more I have a sensation of walking up that beach and rounding the point in the distance. What pulls me in are the lines. Photographers call them leading lines because that is just what they do, lead. They are meant to pull you into the image. There are several leading lines in this image. Most noticeable is probably the line between the water and the sand. It leads to the point in the distance from just above the right center side. Above it is the line separating the water from the sky, and above that the thin line of clouds that pulls my eye across the frame. The cliff on the right forms an angle of two lines, one on top, the other at the bottom which also take my eye to the point. More subtle are the tire tracks from a lifeguard jeep in the sand. All these leading lines are fairly straight, but none of leads you from the front of the image. There is one that does, and it isn’t straight. I’m not sure you could call it a line, but it accomplishes the same task. It leads you from front to back right to the point. 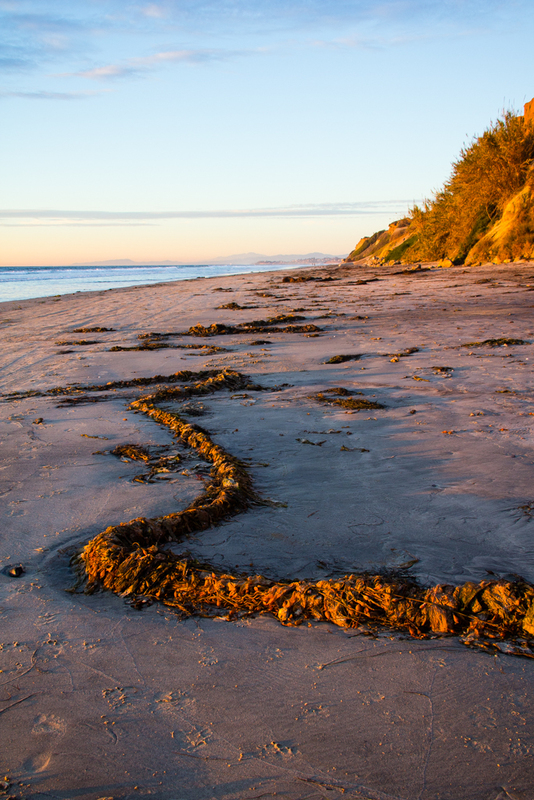 It is the curving rope of seaweed. It takes you to the mid-point of the image curving back and forth before leaving your eyes to jump to the next pile and to the next, and the next, following a path to the point. Very much like what you would do if you were strolling up the beach, just without the flies. See more images from Del Mar in Places and Travel.